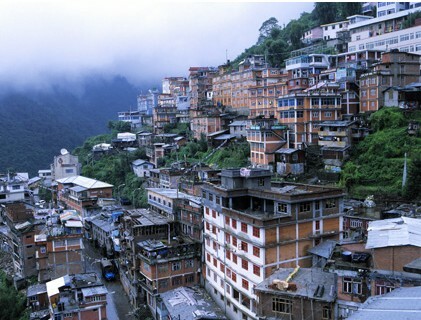 Zhangmu Town lies in the southern piedmont of the median Himalayas, about 776 km. (482 mi.) 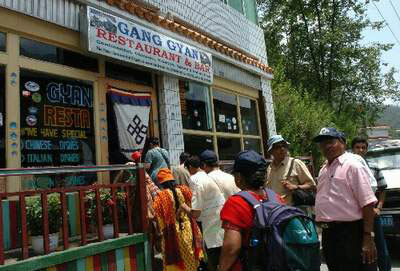 away from the capital of Tibet Lhasa. It also borders Nepal to the south; Sino-Nepal Friendship Bridge is only 10 more km. (6 miles) away and another 100 km. (62 miles)'s drive will lead you into the capital of Nepal, Katmandu. After the drudgery of the Sino-Nepal Road, Zhangmu Town is a most welcome sight both for tourists and traders alike. Much is supposedly owed to nearby Mt. Everest, the highest peak in the world. Travelers come mainly for climbing up the lofty mountain, appreciating the heavenly sights, or pilgrimage at its holiness. However, for the particular location, Zhangmu Town itself can form an interesting array of scenery for the visitors. At the altitude of about 2300 m. (7,546ft.) and with the subtropical climate, Zhangmu Town is mild and humid, which can be an extravagant hope for the common dry and cold Tibetan area. The natural scenery there is very charming. It is absolutely embraced by wondrous mountains, flexural rivers, lush pines and flourishing flowers almost all the year round. Along the winding road in the middle of peaks and gorges, you will be unconsciously assailed by the fulgurous waterfalls, enjoying another tasty variety from the eternally snow-covered Himalayas. Please get to the location of Sino-Nepal Tunnel and appreciate the best scenery of the mountains. As a port, Zhangmu Town is also very noisy and modernized with many grand buildings. You can find customhouse, business bureau, factories, shops, banks, post offices, schools, hotels, restaurants and resident buildings arranged orderly beside the street. The bazaar is always crowded with various skin-colored tourists and businessmen. Walking here, you may feel like bees in a hive. Most striking are the numerous red villas topped with small gardens, aflutter with prayer flags and lucky trees, which add much color to the town. The buildings at the turn between business bureau and electric station ditch are the best point to look around the town. Shigatse Region that Zhangmu Town is located in has many natural and cultural scenic spots, such as Mt. Everest, Palkhor Monastery, Tashilhunpo Monastery, Rongbuk Monastery, Pala Manor, etc. Please ensure you take your ID card or passport and border card for the checkpoint. Umbrella and skid-proof shoes are also necessary for the rainy and bumpy path is often treacherous. You can take the sightseeing bus via Zhangmu Town by the way, but you should contact the guide or driver first at the hotel. For changing money into Nepalese Rupees, you can refer to Bank of China. Bus Route: There are no buses running between Lhasa and Zhangmu, you can hire a car at the reception desk of hotel.